Sriracha (pronounced see-rotch-ah) is all the rage these days. This paste-like sauce is bright red and is a type of hot sauce or chili sauce made from a paste of chili peppers, distilled vinegar, garlic, sugar, and salt. This hot sauce is gaining popularity as a street-food condiment and is being used more and more in cooking (here are 25 of the best sriracha recipes out there). There's even a movie about the popular sauce that was supported by over 1300 people on Kickstarter - see more about the documentary here. The hot sauce can actually be a healthy choice - greatist.com says that studies suggest that chili peppers can speed up metabolism and suppress appetite. They compiled a list of 50 Healthy Meals Made Even Better With Sriracha Hot Sauce. 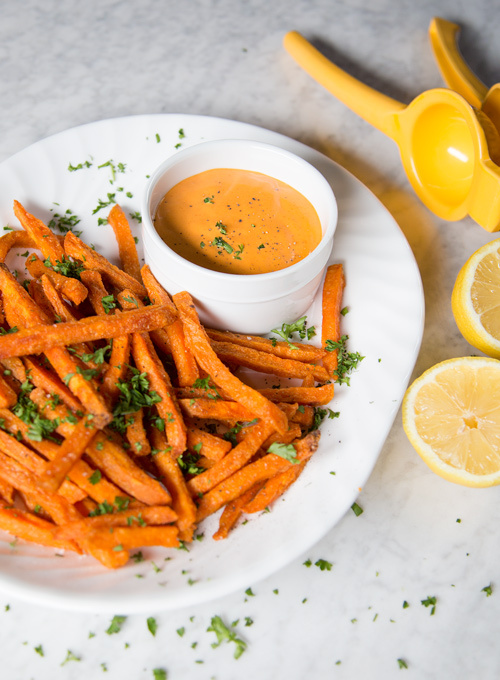 We wanted to get in on the sriracha craze so we decided to create a sriracha mayo that can be used for dipping (we loved it with sweet potato fries! ), spreading or as a dressing. What would you eat with this recipe? Do you want to see more sriracha recipes? Let us know in the comments below! Add ingredients to Twister, FourSide or WildSide+ jar, and secure gripper lid. Get nutrition information and full recipe on the Blendtec Recipes page.